The inner workings of product specification can be complex and difficult to navigate. If you want your product to be specified, you need to know your audience, what matters to them and their role in the specification process. The four key players who make up the specification dream team are architects, specifiers, general contractors and interior designers. Architects, are typically at the head of the specification team. According to the AIA Survey Report of Firm Characteristics, 75 percent of architects work in firms with two to 49 employees. These architects are multi-disciplined and often serve as the firm’s product specifiers. Architects are extremely detail-oriented and meticulous. They need to fully understand all product details before they make any decisions about specification, so be sure that your product data sheets are descriptive and offer everything that an architect would need to know about your product. Make their job easier by taking the guesswork out of their product evaluation efforts. Specifiers are most often employed at large architecture firms. Many are seasoned architects who chose to specialize in specification. Their role in the specification process is to advise the entire design team about the best product for a particular project, so naturally they’re extremely critical of the products that cross their desks. You want the specifier on your side. They won’t just take the product information at face value -- they ask the tough questions to get to the best product solution. Be a resource to the specifier. Make sure that your website has detailed information and appropriate content that’s easy for the specifier to locate and download. Just because and architect or specifier has specified your product for a project, it doesn’t necessarily mean you’re out of the woods. General contractors are always looking for products that will reduce their costs while improving efficiencies, especially with installation. Even though the general contractor is at the end of the specification funnel, he still wields a great deal of influence over the products selected. For example, if he had a negative experience using your product in the past, he can replace it with a comparable competitive product that fulfills the spec. Because general contractors gain product information from several sources - distributors, peers, industry events, websites, publications and social media - it is critical to employ marketing efforts, both online and offline, that directly target this audience segment. 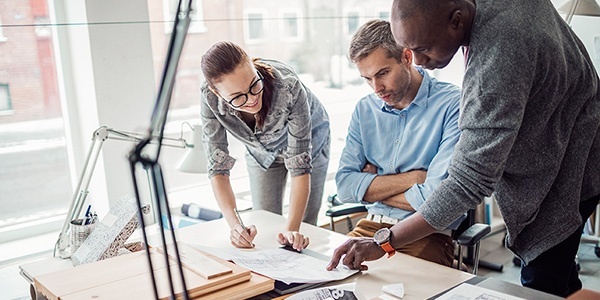 A very small percentage of architecture firms have interior designers on staff. Most designers are independent and partner with smaller, specialized architecture firms and consult with clients to determine needs and preferences. Their role in the specification process is to plan and specify interior design materials in accordance with the most up-to-date practices, codes and standards. Be mindful that the designer is most concerned with pleasing her client. Be a partner to her and give her the tools and information to make the case for choosing your product for the design. It’s not enough to market to one person during the specification process. You must engage with each individual that influences specification. Take the first step by evaluating your marketing through the lens of each audience (architects, specifiers, general contractors and designers) to understand if your efforts are effectively attracting and engaging them.